Kasian has developed the new offices of pipeline company located in Calgary, Alberta. 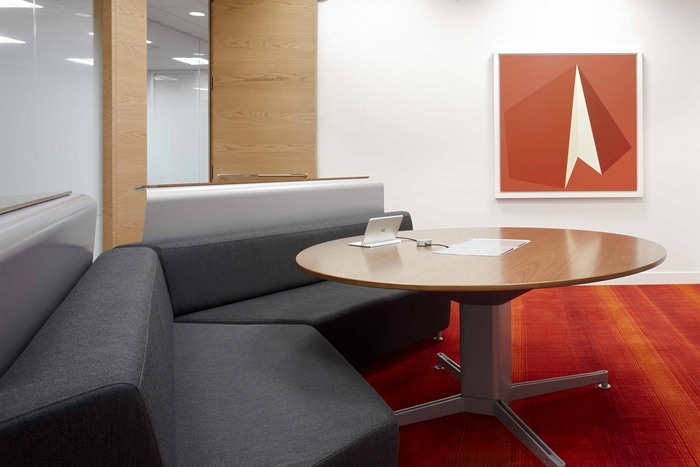 The re-imagined workplace of this pipeline company includes a shared zone on every floor to provide meeting, collaborative and social spaces for staff and visitors and is branded in the energetic red and yellow tones of the company logo which are incorporated into the colour palette to signify areas of energy and activity, primarily in spaces of collaboration and social interaction. These zones of colour are contrasted by a calmer, more neutral palette in the areas dedicated to concentrated work. Alternate work settings, training and social gatherings are further supported by a shared coffee bar lounge space and meeting room facility. The renovation of the new corporate environment is designed to meet the corporate goals of enhancing collaboration, teamwork and the speed of decision making; appealing to younger generations while also recognizing their existing formal business culture; increasing density and the effective use of space; improving access to natural light and views for all staff; and maximizing future flexibility. The renovation provided opportunities to integrate the corporate brand within the workplace, promote the company’s connection to the environment and the community, and support the evolution of the culture to one that is less formal and hierarchical.